Ever need to type a euro symbol, or infinity, or an umlaut? You're in luck. If you do much typing at all—especially if you dabble in graphic design or publishing—you’ll eventually need hidden typographic characters such as ®, ©, ™, ° and maybe even € and £. 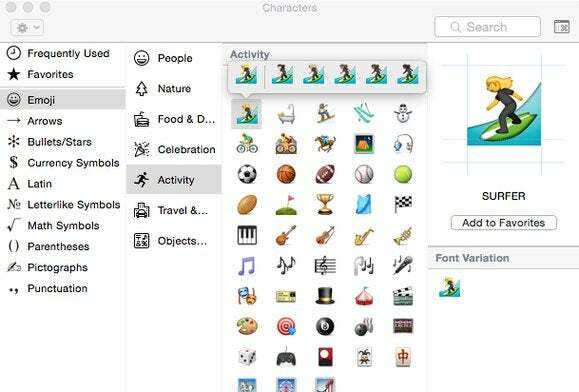 Back in 1984, the geniuses at Apple predicted you’d need easy access to these characters, so they built them right into your Mac’s keyboard. But how do you find them until you know where to look? In this column, you’ll learn keyboard shortcuts for the handiest hidden characters, as well as how to locate even more using OS X’s Keyboard and Character Viewers. The super handy Character Viewer conveniently clusters the characters in all your active fonts into logical groups. For example, the elusive Ⓟ character lives in the Letterlike Symbols group. Click once to see variations of that character in other fonts, and double-click to insert it into your text. The Character Viewer even remembers the characters you use the most—simply click Frequently Used to see them. You can also add a character to your list of Favorites by clicking the “Add to Favorites” button beneath its preview on the right. 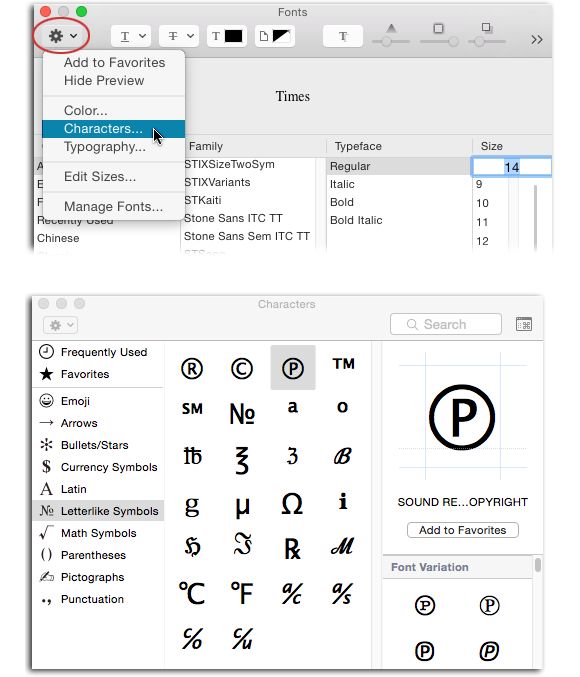 The Character Viewer is also your go-to source for finding and using the thousands of picture-based characters in fonts such as Apple Symbols, AppleGothic, and Lucida Grande. For kicks, grab your favorite beverage, settle in, and then click the Pictographs group and scroll through the symbols—you’ll spot playing cards, chess pieces, dice, dominos and even astrology symbols (great for party invitations!). Click the Emoji group and you’ll quickly become lost in a puffy, colorful world. For access to even more symbols, click the icon at the upper-right of the Character Viewer (circled below) to open a smaller version of the window in which you can scroll to the bottom for technical symbols such as ⌘ and ⏏, and signs such as ♻︎. 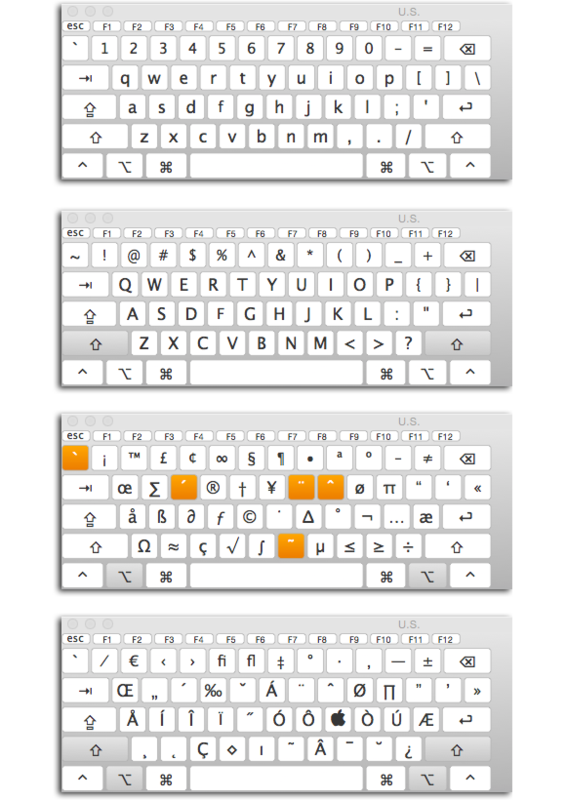 Unfortunately, whereas you can use the Keyboard Viewer in all applications—it floats above almost everything—the Character Viewer is limited to apps that use Apple’s Fonts window, such as Pages, TextEdit, and Keynote. 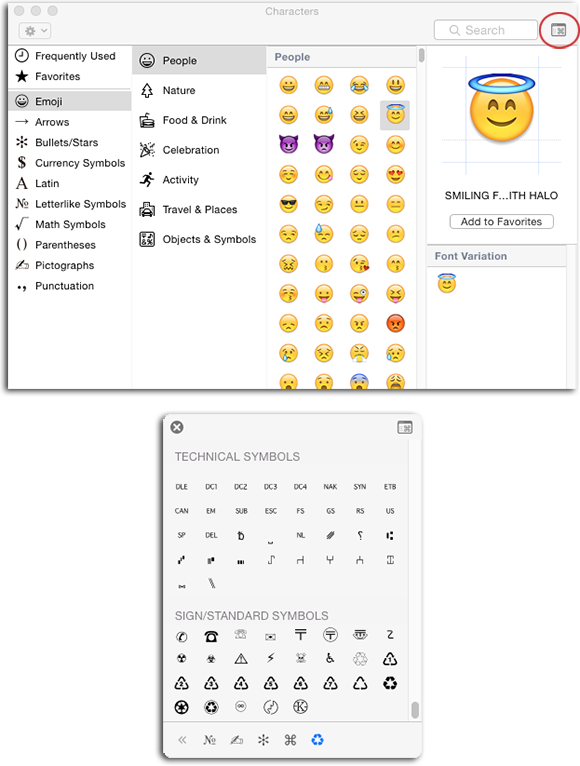 Adobe InDesign, Illustrator, and Photoshop have similar functions in the Glyphs panel, which is accessible by choosing Window > Glyphs or Window > Type & Tables > Glyphs (depending on which app you’re using). To open QuarkXPress’ Glyphs palette, choose Window > Glyphs. If you use Microsoft Word, you’re out of luck until they release Word 2016—then choose Edit > Special Characters. If you find yourself using these character-finding tools very often, save some time and sanity by investing in PopChar, a €30 utility (about $33 at this writing) from Ergonis that gracefully provides all the features discussed above and more, in any application. Click here to read a review. As you can see, accessing the wide world of hidden characters is easy once you know where to look. Until next time, may the creative force be with you all!